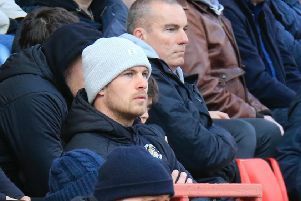 Town chief Nathan Jones was quick to praise full back Stephen O’Donnell’s display at Leyton Orient on Saturday after the defender was a late inclusion due to James Justin’s injury. The teenage full back had been named on the official teamsheet, but picked up a calf injury in the warm up, as O’Donnell, who was on the bench after being dropped for the last four league games, came back in for his first start since the 2-0 defeat at Crawley. Up against the tricky Sandre Semedo, O’Donnell didn’t let anyone down during the 90 minutes, with Luton winning 2-1, as boss Jones said: “It’s the second time we’ve had to do that now (Alan Sheehan at Plymouth), but our players are professional enough that they prepare well anyway. “James just pulled a calf in the warm up, so it was a straight swap, no issues and early enough that we didn’t have to scramble. “Sods came in and did fantastically well as he’s been unfortunate to be out, because he’s training very, very well. Probably slightly better than James at the minute, and that’s whether James is feeling the pressure of having been in the side, so I had no issues whatsoever. O’Donnell played his part in a solid enough defensive display, as Jones admitted they had been mindful of an Orient team under new management with Italian Alberto Cavasin taking over recently. He continued: “I think we were wary of the new manager having a bit more time to work with them, and getting a bit more structure, but apart from the first half cross for Ollie Palmer’s header, they didn’t really carve us open. “It was a similar story to last year, obviously we got the two goal lead this year, but we dealt with any aerial threat they gave us. “It was a good away performance, we weren’t fluent, but we defended well, worked hard, counter attacked, we were always always a threat and deserved winners.